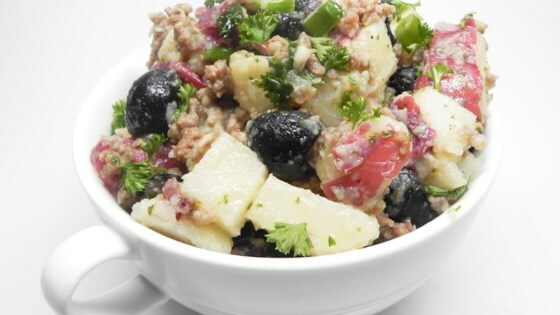 "This is a delicious potato salad that includes sausage, olives and many other zesty flavors. It's great to serve at a summer picnic lunch or barbecue." In a blender, combine the oil, vinegar, parsley, salt, sugar, anchovy fillets and garlic. Puree until smooth. Bring a large pot of salted water to a boil. Add potatoes and cook until tender but still firm, about 15 minutes. Drain, cool and cut into cubes. Pour prepared vinaigrette over potatoes and marinate overnight. Combine the potatoes and dressing, sausage, green onions, parsley and olives. Toss together well and season with salt and pepper to taste. A gourmet salad. Drain the oil before serving. I ommitted the anchovies and added artichokes and Kalamata olives. I also substituted red wine vinegar instead of the white wine vinegar.